President Obama is holding on to a five-point lead over Republican Mitt Romney in Ohio, but that margin has been cut in half since September, according to a new Quinnipiac University/CBS News poll. Mr. Obama holds a 50 to 45 percent lead over Romney among likely voters in the Buckeye State, down from a 53 to 43 percent advantage on Sept. 26. Three percent of likely voters there are undecided. A gender gap persists: President Obama still has a double-digit advantage among women, 55 to 40 percent (down from a 60 to 35 percent lead in the September poll), while Romney leads with men. The president enjoys a 15-point lead with women, while Romney is ahead by seven points among men, 51 to 44 percent, virtually unchanged from last month. Mr. Obama has a nearly two to one lead with unmarried women, but married women are more divided in their vote preferences. While seniors were split in their support last month, they are now backing Romney over the president, 51 to 44 percent. Young voters still support President Obama by a large margin. Romney has made some inroads with independents; he now leads among this group by seven points, 49 to 42 percent. Romney had a one-point advantage among independents in September. The president is viewed as better on foreign policy, 50 to 43 percent, which will be the focus of tonight's debate, but his lead has shrunk from 13 to seven points on this measure. The candidates are now even on handling the economy; last month, the president led by six points on this issue. Romney has also widened his lead over the president on handling the budget deficit. The president continues to be seen by Ohio voters as caring about their needs and problems - 60 percent say he does while just 37 percent say he does not - similar to last month. While Mitt Romney has improved on this measure, more voters continue to think he does not care about their needs and problems than think he does. Men and women view Mitt Romney differently on this characteristic. While 51 percent of men think Mitt Romney does care about their needs and problems, most women do not. Majorities of both men and women think Barack Obama cares. When it comes to who would do a better job helping the middle class, Mr. Obama has a 13 point lead over Mitt Romney, 54 to 41 percent. Early or absentee voting has already begun in most states across the country. One in five Ohio likely voters in this poll say they have already cast their ballot, and the president leads Romney among this group 54 to 39 percent. Among likely voters who have yet to cast their ballot, the race is much closer: the president leads 49 to 47 percent. As has been the case throughout this election campaign, Ohio Republicans continue to be more enthusiastic than Democrats about voting this year. Fifty-two percent of Ohio Republicans say they're more enthusiastic compared to 40 percent of Democrats. Enthusiasm among both Republicans and Democrats has increased since last month, but Republicans still have the advantage. In addition, Romney's supporters in Ohio are now more strongly behind him. 63 percent strongly favor him now, up from 51 percent last month. But the president still has the advantage on this: 74 percent of his voters strongly back him. The two presidential candidates met for a second debate last week, and Ohio likely voters think Mr. Obama came out the winner. Forty-eight percent thought the president won the debate, 27 percent thought Romney won and 12 percent said it was a tie. Partisanship plays a role here: Most Democrats think Mr. Obama won the debate, while most Republicans say Romney was the winner. Independents choose Mr. Obama as the winner, 43 to 29 percent. Still, most Ohio voters (more than six in 10) say the second debate will not impact their vote choice. Among those who say it will, 19 percent say it makes them more likely to vote for Mr. Obama, while 14 percent say it makes them more likely to vote for Romney. 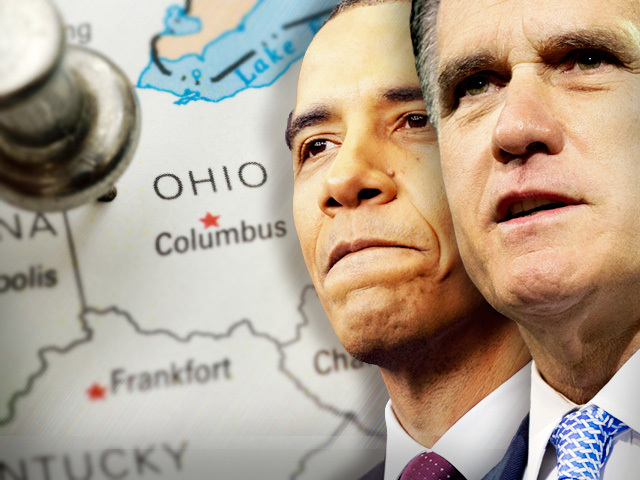 Heading into the final debate tonight, 40 percent of Ohio voters expect Mr. Obama to win that debate, while 31 percent think Romney will be the winner. Voters in Ohio are more optimistic now about both the national and state economies than they were in the summer. Now, 37 percent of Ohio voters think the nation's economy is getting better - up from 26 percent at the beginning of August - while 46 percent believe Ohio's economy is improving - up from 33 percent. This poll was conducted by telephone from Quinnipiac University's interviewing facility October 17-20, 2012. The number of Ohio likely voters interviewed is 1,548. Phone numbers were dialed from samples of both standard land-line and cell phones. The error due to sampling for results based on the sample could be plus or minus three percentage points. The error for subgroups may be higher. This poll release conforms to the Standards of Disclosure of the National Council on Public Polls.